Gua Sha is a medical treatment used in Chinese medicine and throughout South East Asia. In Indonesia the technique is called Kerik, in Vietnam: Cao Yio and in Laos: Khoud Lam. “Gua” means to scrape or rub. “Sha” is the term for the reddish raised skin rash that occurs as a result of the scraping. Sha refers to the blood stagnation in the subcutaneous tissues before and after it is raised as the reddish skin rash (petechiae) or bruising (ecchymosis). Gua Sha involves lubricating the skin with oil (traditionally a thick oil such as peanut was used) and using a smooth edged instrument, the acupuncturist uses long or short strokes causing redness or bruising. The most common areas for treatment are the yang areas of the body such as the back, neck, shoulders, buttocks, limbs. Occasionally the chest and abdomen are used as well. There are also types of facial Gua Sha that are used in conjunction with cosmetic acupuncture treatments to help increase circulation, elasticity and firmness of the skin. Gua Sha does however cause temporary ecchymosis (or bruising) which fades in 2-4 days. In TCM theory, the intensity/severity of the bruising is an indication of the severity of the toxicity, stagnation or fever inside the body. Gua Sha is used to treat as well as prevent the common cold, flu, bronchitis, asthma, and pain both acute and chronic. It is also used to detoxify the body, and alleviates fevers as the scraping brings the excess heat and toxins to the surface of the body to be released. When used for pain there may be an achy feeling, tenderness or knotted feeling in the muscles. It is excellent for treating colds or flus especially if there are respiratory problems or high fever. Any problems of qi or blood stagnation can be successfully treated with Gua Sha. Gua Sha has a special function to relieve fevers and inflammation of the respiratory system, and performs very well in conjunction with acupuncture and cupping for these conditions. What Does The “Sha” Tell You? The colour and intensity of the Sha is both diagnostic and prognostic. If the Sha is very light in colour it indicates a deficiency of blood. If the Sha is a fresh and intense red, it means the condition is acute and has not yet penetrated deep into the body. If the Sha is black or purple in colour it indicates blood stagnation which means the condition has been long standing. If the Sha is brown, there may be dryness in the body and a deficiency of fluids. Dark deep red Sha indicates heat. The Sha is a good reflection of detoxification and fever release. What Tools Do You Use for Gua Sha? There are many things that can be used to do Gua Sha. Traditionally, a slice of water buffalo horn, a piece of jade, a Chinese soup spoon, or a coin were used. You can basically use anything with a rounded edge. Now there are many tools of various sizes and shapes that are used for Gua Sha. 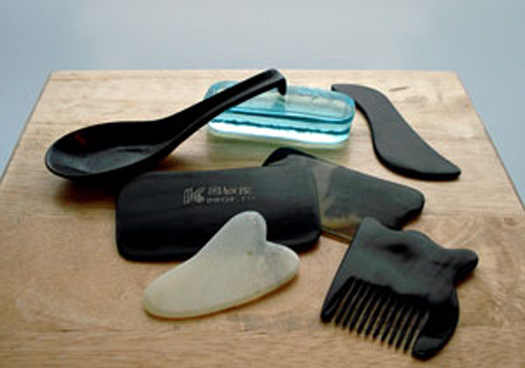 Below is a photo of some common Gua Sha tools. It is also important to lubricate the skin before administering the Gus Sha. Various massage oils can be used. You can also use peanut oil, almond oil, coconut oil or vicks vaporub as a lubricant. The area of skin to be treated is applied with oil as a lubricating medium. The acupuncturist then takes the Gua Sha tool and strokes the skin in a downward motion until the petechia form. If there is no blood stasis, stagnation or fever, a rash (petechiae) will not form and the skin will only turn pink. Gua Sha is stimulating to the immune system, detoxifies, increases circulation, regulates organ function, normalizes metabolic processes, removes stagnation and eases pain. After a Gua Sha treatment, a patient usually feels a shift or release especially if there was pain. There is often sweating which is the body’s way of releasing toxins that have been inside the body. Gua Sha revitalizes, rejuvenates, helps diminish stress, fatigue and severe exhaustion. It helps to release emotions, relaxes the body and helps to clear the mind and senses. Gua Sha is a simple treatment, but incredibly effective for many ailments which is why it has been used in China and South East Asia for thousands of years.